New gameplay footage of Valley and uncover the secrets of its mysterious world this summer. Valley, in development from Blue Isle Studios, makers of the popular horror game Slender: The Arrival, promises a first-person adventure like none other. Players will pilot the L.E.A.F. exosuit, powering up their physical abilities to unheard of levels then exploring the massive world from above and below -- dashing over landscapes, leaping between structures, all while wielding control over both life and death. 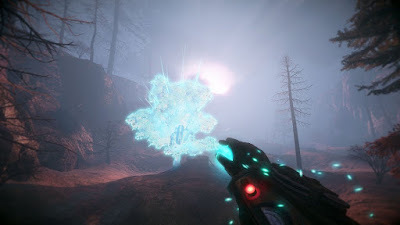 As you’ll see in the video, intrepid players can do some truly incredible things as they seek to further uncover the mysteries of the valley: give life to dying trees and animals; leap the distance of an entire football field; swing through a Pathfinder training forest of ginormous trees; and even defend oneself against some mysterious enemies. These are just some of the many awesome things you’ll be able to do as you explore the ancient depths of the valley, all the while keeping both it and yourself alive. Valley launches this summer on PS4. There’s so much to explore and discover.